It is another windy day though much less so than the last two days. Walking by the bay windows I saw this pelican come into view. I managed to fire up the iPhone 7 to get this short clip of the bird and the magnificent day. The bright heavy setting sun on June 14, 2009 seemed floating in air. It sat just near the end of the bowardwalk, at Smith Point Park beach, just beyond the signs for the TWA Flight 800 Memorial, like an easy stairway to heaven. Here we are on earth, walking or flying, thinking we own it, yet we are so insignificant. One tiny wobble of that white orb in the sky and we are all history. Even if it remains perfectly aligned forever, we are certain to be history. So many voices that had walked these paths, these stairways, before us. All gone, as we one day will. Some of them are remembered, many forgotten; lost, first to memories, then to history, and then to eternity. Would we be remembered? And, why? It seemed so easy to reach, yet so far away. It felt burning hot in a cold blue sky. 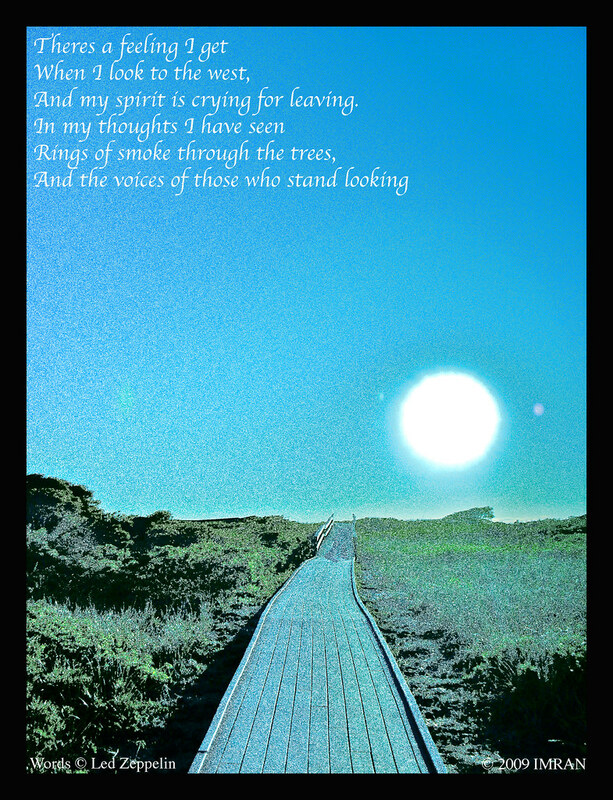 It inspired me to experiment with this picture and the words of Stairway To Heaven just seemed so appropriate…. It made me wonder, it makes me wonder, and it will always make me wonder.